Age of Elegance is owned and operated by Julie and David Vezmar. Corporate offices are located in Mill Valley, California. Julie and I both grew up in Northern Indiana near Chicago. My interest in antiques began when I was just a kid. The antiques and colorful old windows in the homes of relatives and neighbors seemed fascinating. My own house had beveled glass windows and doors, cast brass hardware, and a faceted glass chandelier. It seemed curious to me that most people ignored or even disrespected these remarkable items. At that time, South and West Chicago were experiencing a wave of urban renewal. 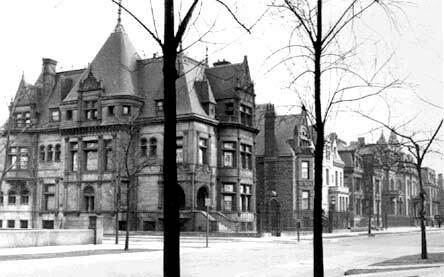 Instead of being renovated, many elegant Victorian houses were being demolished, along with their dazzling antique windows and dramatic architectural elements. Seeing magnificent old houses with amazing windows being bulldozed puzzled and saddened me. As a kid, I could do nothing more than watch. I went to college at Indiana University in Bloomington, Indiana, and studied business. During school breaks I worked as a carpenter, a skill I'd naturally acquired while growing up in a family of woodworkers. It was while I was a student that I bought my first antiques to furnish rental houses, partially because antiques were affordable and partially because I thought they were cool. After purchasing the Popular Science Skill Book “How to Do Your Own Wood Finishing,” my relationship with antiques forever changed. Revealing lustrous hardwoods that were long-hidden beneath multiple coats of paint is a transforming experience. I developed an intimacy and a passion for beauty and craftsmanship. My wife Julie shares this passion. In 1972, I graduated from Indiana University. In order to make postgraduate life simpler I decided to sell the contents of my rental house before I moved. To my delight I ended up with thousands of dollars, which included a sizable profit for my efforts. This was exciting! My eyes opened to the antique business. While living in Bloomington I purchased my first three stained glass windows, one at a time. While living with them, a curiosity developed within me about antique stained glass. I wanted more knowledge. Just a few books existed at that time with information on the subject, and that information had little practical value to me as a future dealer. When were they specifically made? How can you tell them all apart? Where were they made? What are the different types of glass called? What criteria is used to judge the different levels of quality? For over a year I visited antique stores and shows to learn as much as possible. During that year, 1973, I met the love of my life, Julie, as she was about to graduate from Purdue University in the School of Nursing. Together we talked to dealers, collectors, and anyone else who could give us some facts. In reality, it was frustrating; few people seemed to have tangible knowledge about antique windows. Or if they did, these people were not willing to part with this knowledge! We quickly began selling windows to other dealers on a wholesale basis. Other panels were sold directly to clients who where either building new homes or renovating old ones. Our contacts grew as did our enthusiasm. 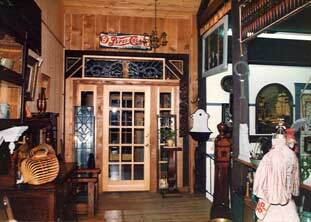 Demand and interest allowed us to open our first antique store in 1974 in Nashville, Indiana. Nashville was a small picturesque, art-oriented hamlet of 500 people. The town had been, and is, a hotbed of antique activity which draws customers from several surrounding states. We decided to concentrate on architectural antiques and stained glass windows in particular. Our store, Age of Elegance, was instantly successful, and in 1977 we started another store in Bloomington, Indiana. Over the years Julie and I have shipped large numbers of windows to dealers around the country. In 1977, when visiting a dealer on the West Coast, we discovered the charms of the San Francisco Bay area. Seven years later in 1984, Julie and I moved West along with Age of Elegance. Our son, Rob, was born in 1990. Rob is an important part of Age of Elegance and he has a remarkably keen eye for antique glass! Since the beginning of Age of Elegance in 1974, Julie and I have placed more than 5,000 antique windows. Our customer base is all across the country and has grown primarily by word-of-mouth from satisfied customers. 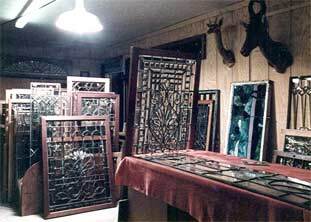 This web site, launched in 2005, will help expose more people to antique stained and beveled glass. We will endeavor to continue to post information that will help you understand and appreciate antique glass.